WASHINGTON -- President-elect Donald Trump on Thursday abruptly called for the United States to "greatly strengthen and expand its nuclear capability" until the rest of the world "comes to its senses" regarding nuclear weapons. Trump made the statement on Twitter and did not expand on the actions he wants the U.S. to take or on the issues he sees around the world. His comments came one day after meeting with incoming White House national security adviser Michael Flynn. Trump's transition website says he "recognizes the uniquely catastrophic threats posed by nuclear weapons and cyberattacks," adding that he will modernize the nuclear arsenal "to ensure it continues to be an effective deterrent." Beyond that, he has offered few specifics, either as a candidate or during the transition. Trump's vanquished campaign rival Hillary Clinton repeatedly cast the Republican as too erratic and unpredictable to have control of the nation's nuclear arsenal. Ten former nuclear missile launch operators also wrote that Trump lacks the temperament, judgment and diplomatic skill to avoid nuclear war. Trump was spending Thursday at his private estate in South Florida, where he has been meeting with advisers and interviewing potential Cabinet nominees. He is also building out his White House staff, announcing that campaign manager Kellyanne Conway will join him in the West Wing as a counselor. Conway, a longtime Republican pollster, is widely credited with helping guide him to victory. She also is a frequent guest on television news programs. Trump called Conway "a tireless and tenacious advocate of my agenda." The president-elect has spent part of the week discussing national security issues, including the deadly attack on a Christmas market in Germany. He called the violence an "attack on humanity" and appeared to suggest a willingness to move ahead with his campaign pledge to temporarily ban Muslim immigrants from coming to the United States. Trump proposed the Muslim ban during the Republican primary campaign, drawing sharp criticism from both parties. During the general election, he shifted his rhetoric to focus on temporarily halting immigration from an unspecified list of countries with ties to terrorism, though he did not disavow the Muslim ban, which is still prominently displayed on his campaign website. The president-elect, when asked Wednesday if the attack in Berlin would cause him to evaluate the proposed ban or a possible registry of Muslims in the United States, said, "You know my plans. All along, I've been proven to be right, 100 percent correct." "What's happening is disgraceful," said Trump, who deemed the violence "an attack on humanity," and added, "it's got to be stopped." A transition spokesman said later Wednesday that Trump's plans "might upset those with their heads stuck in the politically correct sand." "President-elect Trump has been clear that we will suspend admission of those from countries with high terrorism rates and apply a strict vetting procedure for those seeking entry in order to protect American lives," spokesman Jason Miller said. But transition officials did not comment on whether Trump could also push for the overarching ban on Muslims. The Islamic State group has claimed responsibility for Monday's attack in Berlin that left 12 people dead and 48 injured. On Wednesday, German officials launched a Europe-wide manhunt for a "violent and armed" Tunisian man suspected in the killings. 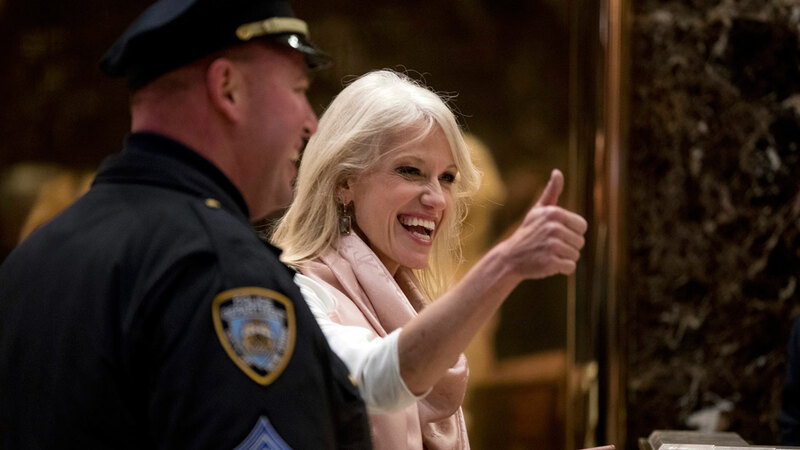 Conway said on ABC's "Good Morning America" Thursday that Trump is "the guy out there saying we need extreme vetting policies, that we need to have a better system vis a vis countries that train, harbor and export terrorists." "He said during the campaign long after he originally proposed that that this would be more strictly tied to countries where we know they have a history of terrorism and that this is not a complete ban," she added. Trump, who addressed journalists Wednesday for less than two minutes outside his palatial South Florida estate, said he has not spoken to President Barack Obama since the attack.